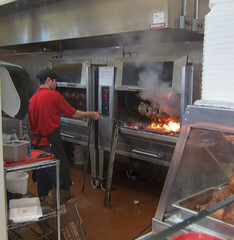 Stepping into Super Pollo, you can immediately tell that it’s a more modern joint then El Pollo Rico. 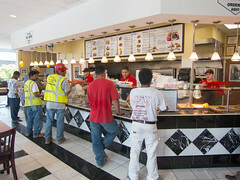 El Pollo is sparsely decorated. 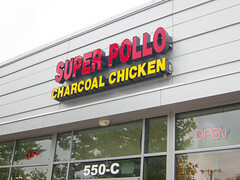 Super Pollo is decorated like a modern fast food joint. But the lines are about the same, with a noon visit having a ~15 minute wait to get your chicken, and similar effort in actually finding an open table. But the other thing that really stands out about Super Pollo is the variety. El Pollo Rico has a menu I can list on one finger (basically, chicken and a choice of three sides). 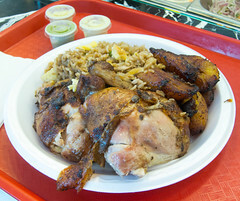 Super Pollo has, in addition to chicken, a wide number of other Peruvian dishes, as well as almost 20 sides, ranging from the simple rice and fries, up to the semi-fancy (cilantro rice, black beans), to the extravagant (fried plantains). They also have a bit more choice when it comes to the chicken: instead of just a quarter, half, or whole chicken, you can get just wings, just white meat, or, my favorite, the “half dark” (two leg and thigh combos). Order up, and watch them hack apart the birds to make your order. Chicken-wise, the chicken is a close match to that of El Pollo Rico: a very nicely crisped up chicken with a very spicy rub on the skin, and a very tender and juicy interior. There’s not a huge amount of magic to making a good rotisserie chicken, but they have it down here. I may give a slight edge to El Pollo Rico’s chicken, but the margin is slight (and may be within day-to-day variance). This is a respectable bird they are serving. And their hot sauce was a rich and flavorful pepper and cilantro paste that was the perfect accompaniment. But they shine on the sides. Instead of my usual rice and cole slaw, here I took advantage of the larger menu, and ordered up both fried rice and fried plantains. The fried rice was delicious, with lots of veggies in it. And the plaintains were perfect, just like going to a good Cuban joint: a soft, sweet interior, and an exterior that was just starting to crisp up and caramelize. Washed down with a Mexican Coke, and this was an excellent lunch. While I continue to have a soft spot for El Pollo Rico, the closer location and wider menu of Super Pollo have probably swayed me over to their camp. I’ll certainly be back.